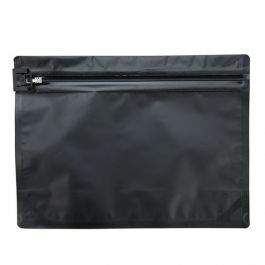 Our CRT912MW child resistant exit bag is designed with innovative technology to keep adult-use items discreet and away from children. 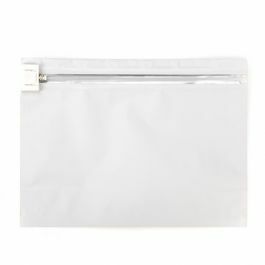 This matte white bag measures 12 1/2" x 4" x 8 1/2" and is approved as a dispensary exit bag for cannabis packaging. Features include a pre-printed ASTM certified message and a unique zipper closure with pre-printed instruction. Made in the USA. Our CRT912MW child resistant exit bag in matte white is ASTM certified to meet all your cannabis dispensary needs. 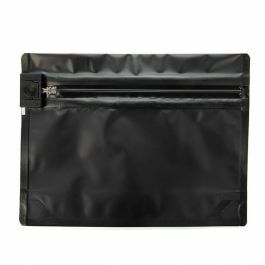 The pouch is made with a unique zipper closure system and has built-in opacity and an odor barrier to keep your items discreet. The outer dimensions measure 12 1/2" x 4" x 8 1/2" with inner dimensions of 11 3/4" x 4" x 8". This bag is ideal for packaging cannabis flower, edibles, concentrates, pharmaceuticals, cleaning pods, and any products you need to keep away from children. Features include pre-printed instructions for opening the zipper, as well as documentation of ASTM compliance. To slide the zipper open, align the locking mechanism inside the notch and press to engage. Made in the USA. Pre-printed message reads: Certified for child resistance in accordance with the U.S. Code of Federal Regulations Title 16, part 1700. Conforms to ASTM D3475. Outer Dimensions: 12 1/2" x 4" x 8 1/2"
Inner Dimensions: 11 3/4" x 4" x 8"